Between December 9th and January 18th, I had at least one of my girls around again and it was great fun! As of yesterday, they have both returned to school and I am once again adjusting to the quiet. In my initial posts after the girls left in the fall, I talked about taking time to grieve. During that time, I often found myself with tears in my eyes when they came to mind. Looking back, part of that was worry. Would they be ok? Would they make friends? Would they be safe? Would they take good care of themselves and go to class and remember to study? As the answers to those questions became clear, when I heard their happy voices and visited them in their new homes and met their new friends, I realized that I no longer needed to worry. They were fine and now it was time to begin to focus on my own life. No more excuses. The first semester went by quickly. I traveled some with my honey, I continued with my work at the Lamb Center and I found a new church. I went to an amazing, inspirational conference and made some wonderful new friends. I cleaned out a few cabinets and TALKED a lot about cleaning out other cabinets and the basement..still working on that one. 🙂 I started writing here again. All these things are great and I am grateful that I had the freedom to take things slowly for a few months. However, now I am getting restless and I think I need a bit more structure to my days. As much as I would like to think of myself as a contemplative type, I think I am happier when I am busy doing things that I love. To that end, I have started to apply for some counseling jobs which, by the way, scares the crap out of me. Not the jobs, but the interviewing process. “So Mrs. Johnson, I see your last job was almost 19 years ago!” I am also pursuing a place to host a workshop later this spring so I can really get serious about this retreat stuff that I want to do. Also very scary. Bottom line, to be completely honest with you, I am more than a little bit scared. 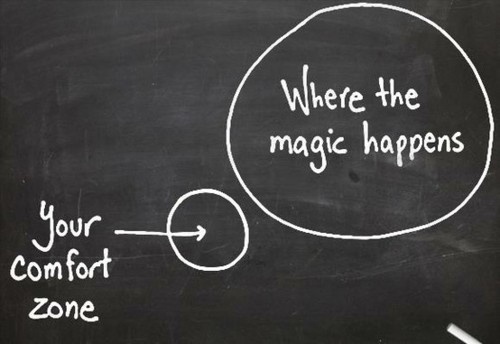 In order to get what I want, I am going to have to step way outside my comfort zone and take some risks. I “listen” to other empty nest moms in the various FB groups I am in and many of them are miserable. Their kids are moving on to new adventures, but they are still clinging to the role that brought them so much joy for so many years. They are counting the days until their kid comes home for the next break. They are stuck. I totally get how that happens. Once I got over the initial fear of breaking them, I became very happy and comfortable in my role as mom and super volunteer. I had my causes to support, but my main focus was the girls. After a few starts and stops, I figured out how to make that all work really well for our family and for me personally. I understand how people get stuck in that place, but that is not what I want. Here is the thing though, avoiding “stuck” or getting unstuck means making a change. Now, I have to DO some new things. Now, I choose to WANT some new things. And new things are often scary. So, remember One Brave Thing? It’s time to be brave, mamas! It’s safe and comfy here, but maybe getting a little boring. Time to dream big and be brave. It’s my turn to chase my dreams, right? Empty nest is just the door to the next adventure! I’ve asked you before but, what is one brave thing you want to do next?